A while back I posted these incredibly addictive pretzels and I thought that there had to be something that I could make that could be savory, but equally delicious. 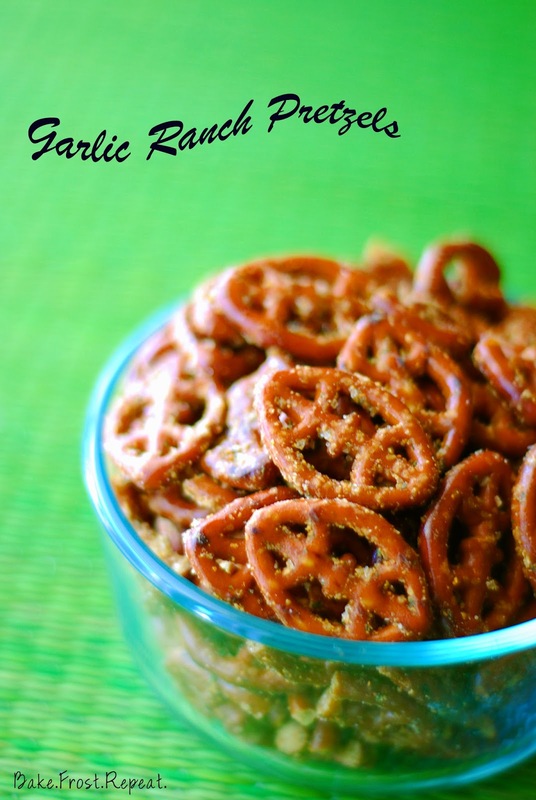 Insert these Garlic Ranch Pretzels. I made these ahead for a Super Bowl party that we will be attending tomorrow and I had to lay the law down with the hubby about staying away from them. Seriously, I had to hide them. Speaking of hiding stuff, do you have a certain hiding place to hide stuff from the hubby? I have tons of places. The trunk of my car, my closet, my daughter's closet, my Mom's house, under the sink with the cleaning supplies....I could go on. But back to the pretzels. Make them, you won't be disappointed. In a large mixing bowl, whisk together the vegetable oil, ranch dressing mix, and garlic powder. Next, pour the bag of pretzels in the bowl and stir until all the pretzels are coated with the ranch mixture. Spread the pretzels out onto a large baking sheet and bake for 15 minutes. Halfway through baking time, stir pretzels to make sure they are coated. Allow the pretzels to cool and then serve. They can be stored in an airtight container. These sound so yummy! I love the football shaped pretzels! The most perfect snack ever! Pinned! These would be the perfect snack for all my binge TV watching!